Here's another favorite of mine. I think this one, above most other puzzles, can truly be described as a mind bender. This is not an optical illusion; the grid lines are there to help demonstrate that all the squares are uniform. Feel free to print out a copy of the picture, cut out the colored pieces in one of the figures and lay them out on top of the other figure to prove that they are indeed the same size. How can it be possible to disect a polygon, rearrange the order of the pieces and end up with less (or more) space than was used before? The complete figure is not a triangle, it is a quadrangle that looks like a triangle. 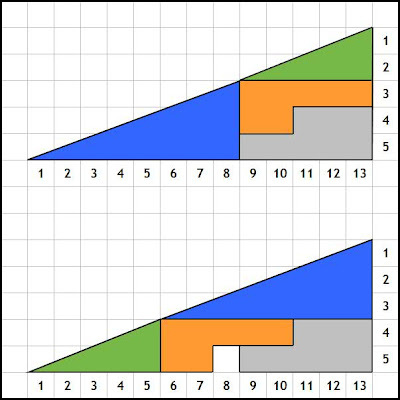 If you calculate and add the area of each piece, you come up with 32 in either arrangement. said another way, the "hypotonuse" is not a straight line, and so using 1/2bh is not the way to calcualte the area. Agreed. The slope of the blue triangle is 3\8 while the slope of the green triangle is 2/5.